I had a good day in the garden earlier this week and then forgot to post the photo! For the most part production has been good this year. We have a couple of newcomers to the party - patty pan (scallop) squash which has been a raging success, and butternut which are producing well but not ready to harvest yet. We also tried out some yellow pear tomatoes - a 'cherry tomato' size - which are a bit mealy for my taste. 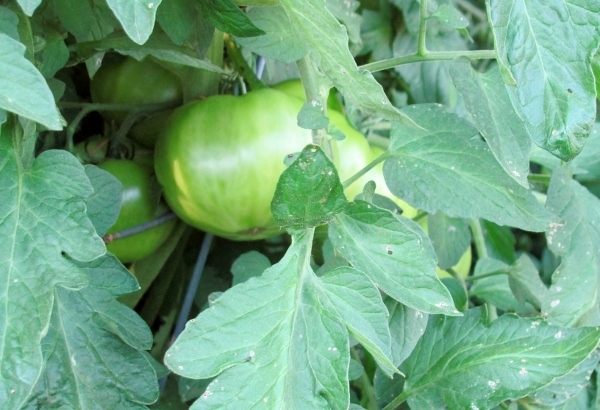 The other two tomato plants, roma and beefsteak, are very late in ripening and not very good. They, too, are a bit mealy/mushy and some got centipedes eating into them. Harrumph! Great jub, zucchini! You really outdid yourself. I have made 32 big loaves of bread, umpteen packets of roasted squash for the freezer, eaten lots, given away many, and even threw one away that was too huge and had gotten hard. The sweet banana peppers had a much better year than in the past but the green bell peppers were only mildly successful. Great yield from the carrots, beets and green onions. Cucumbers have more on the vine than previous years but they are supposed to be growing up to 8 inches long and are only getting to about 5. Very sweet though. I'm thinking that the cukes need to be in the ground instead of in one of the barrels and will try that next year. 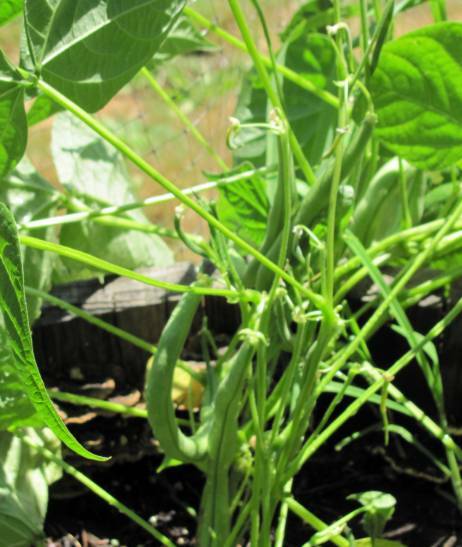 Of course, long gone are the green beans and peas. And I have totally given up on radishes as they have been disastrous every year - not worth the agravation. The corn has tassled and we have some ears forming. Seem to only have one ear per stalk so it's a good thing we planted twice as many. This spring when several of the squash plants did not sprout we lost track of which had been planted where and poked more seeds in the ground where (we thought) they were needed. 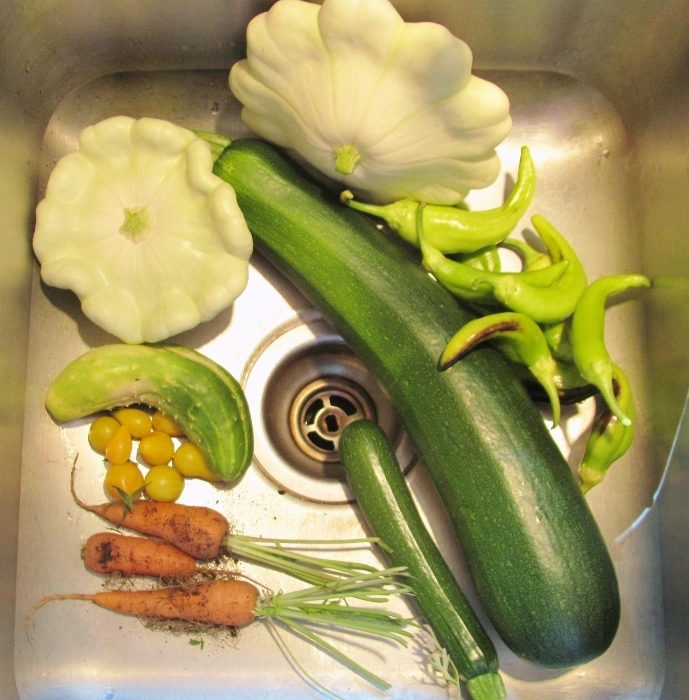 So we ended up with THREE zucchini plants, one crook neck, one delicata but NO butternut and NO pattypan (scallop). Well you know how zucchini can get away from you if you don't watch them like a hawk - and now we'ver got it TIMES THREE! Yikes! I have made 9 mock apple pies (8 for the freezer), several pans of roasted summer squash for the freezer, two batches of zucchini pancakes (one for the freezer) and then when I went out today, BOOM! 4 more huge zucchini. Well, I don't need any more pies so I think I'm gong to make a couple of mock apple crisp and use them at a barbeque later this month. There were also a few regular zucchini so maybe more pancakes are in order. That crookneck was great on the grill the other night so one of these will get that treatment and one will get sliced into rounds and crusted and froze to fry up later like fried green tomatoes. YUM! I also picked some tomatoes for eating out of hand and for salads. There were more cherry tomatoes but I ate them while I was setting up this display. Carrots and beets willl join some store-bought onions and sweet potato in a little roasted action. Hmmm, I may go back out and grab one of the green onions to add to that pan. 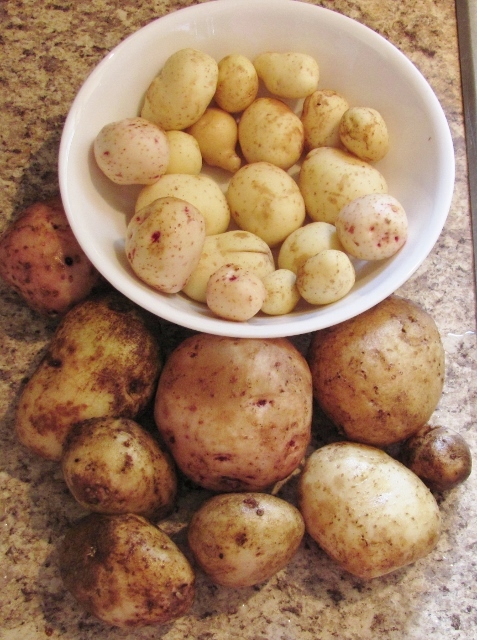 In other garden news: we got a few volunteer potatoes again this year that need dug. Didn't plant any corn at all. One cucumber left on the vine - not much action there, three small cukes and one gargantuan. No radishes planted. Banana peppers are going pretty good. Beans and peas are long gone, but were yummy. Mom has been picking and eating from the plum tree and also picked and froze up about 6 gallons of blackberries. We have a division of labor going on here. I weeded and planted, Mom weeds and waters, we all eat it up. How Do You Like Them Taters? I was using a shovel in damp soil to loosen the weed roots for easier pulling on the 1st of April. What I got from these 'ideal' conditions and action was 4 potato plants about 18 inches tall with a lot of new potatoes and some larger ones. Now, I haven't planted potatoes for two years! We dug a few volunteers last summer and even won a blue ribbon at the fair with them. Mom dug up more volunteers last fall but apparently not all were discovered. The missed taters snuggled in for the winter and, due to great weather - no snow and very light frost - these new plants sprung up. I dug enough of Yukon Gold, Red Potatoes and Russetts to put together a potato salad for Easter. I tossed out 4 small purple potatoes (which I haven't planted for FOUR YEARS) as we never liked them much. There were more of the Russetts but something had nibbled at them and I didn't want to eat their leftovers! I have FINALLY admitted the fact that I cannot grow certain produce. One is radishes - undeveloped roots, woody, dry and hot. No change of soil, seed variety, weather, planting date... has had any effect in the 10 years I have been growing. I faithfully plant every year, trying some tweak or another... failure every time. So I decided to BUY my radishes and use the pot to grow something else this year. I have likewise dropped turnips from the plan for the same reason. 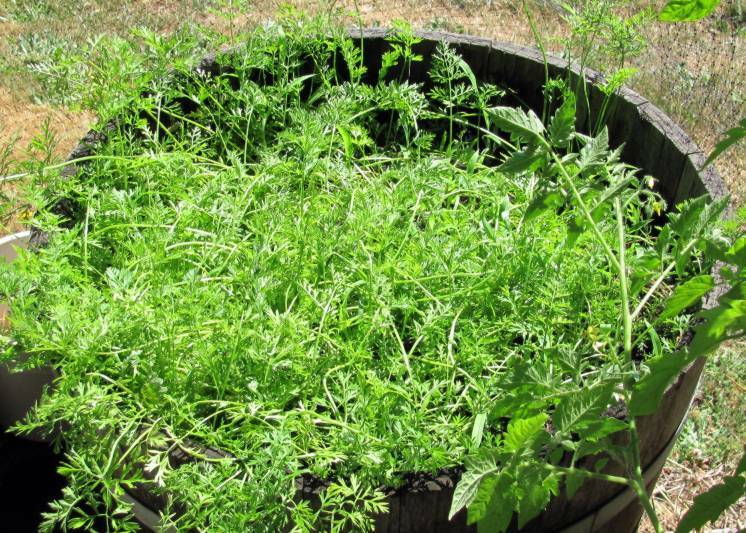 Then, due to some restrictions of diet, I am eliminating spinach and lettuce from my garden which left me with several barrels extra. 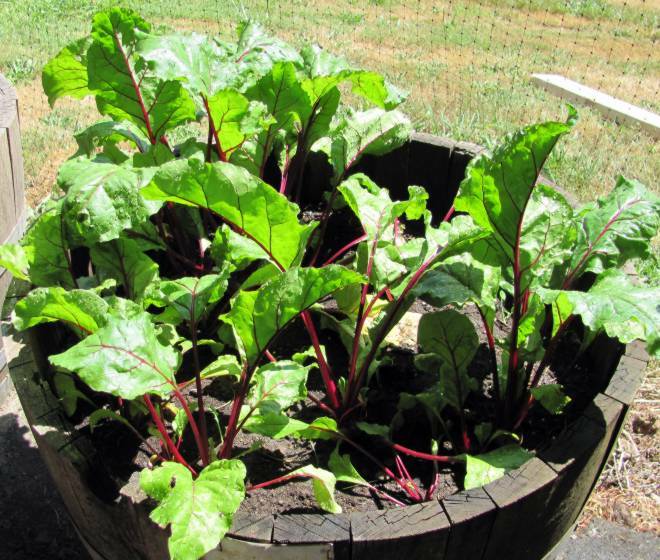 I decided to double up on the things we really like that do grow well - beets, cucumbers, green onions - and split the two varieties of peppers into their own barrels. Out in the big bed we have eliminated potatoes and are expanding the squash. Last year we had only acorn, delicata and yellow crookneck. 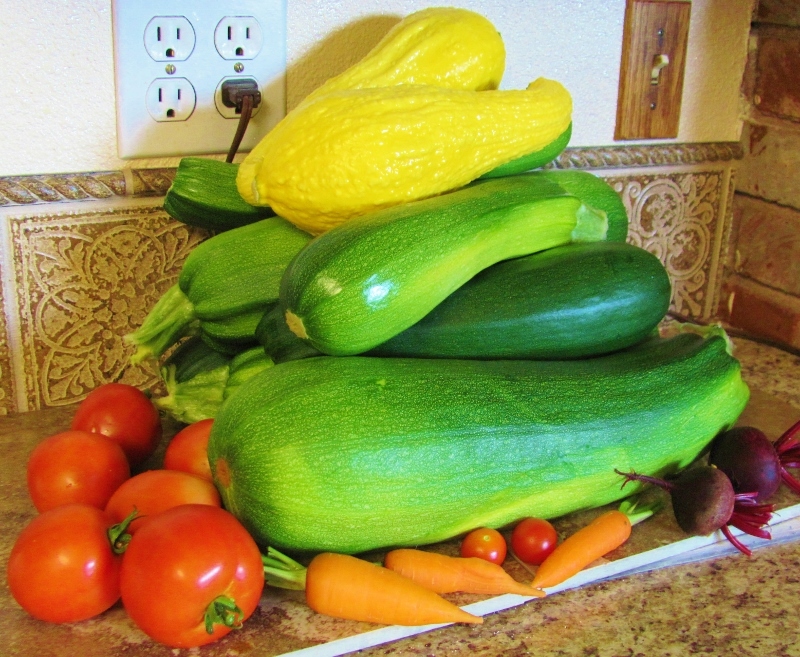 This year we are trading the acorn for butternut and adding zucchini and patty pan (scallop). I hope to process and freeze a lot of the patty pan like we did the fried green tomatoes last year. The bed for the corn remains the same. I'm hoping for a good yield and plan to preserve (freeze) a lot like I did last year. It's fun to have a gardening 'buddy' (Mom) - and one who helps eat up the produce. Technically, this is not 'in the garden' but it IS plant-based! Last Christmas a friend gave us a poinsettia. I would occasionally give it a bit of water but was forgetting so much that I finally moved it to the kitchen window. The green leaves all fell off but the blooms remained. Then, around the middle of MAY little green leaves began appearing. I encouraged it by watering more often and, yes, it got more leaves. 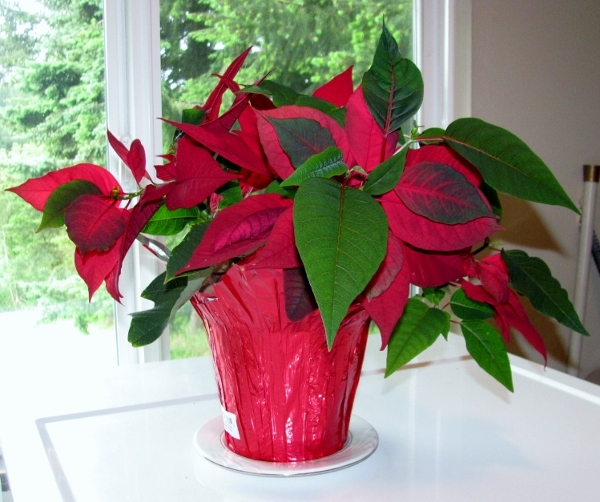 So, here at the first of July, I have a happy and healthy poinsettia that I am hoping I can keep alive until December. Without a doubt this is the longest any plant has LIVED in my house. This first year growing sunflowers was a reasonable success. Out of the 10 seeds I planted there were 7 that germinated and all rose to great heights. 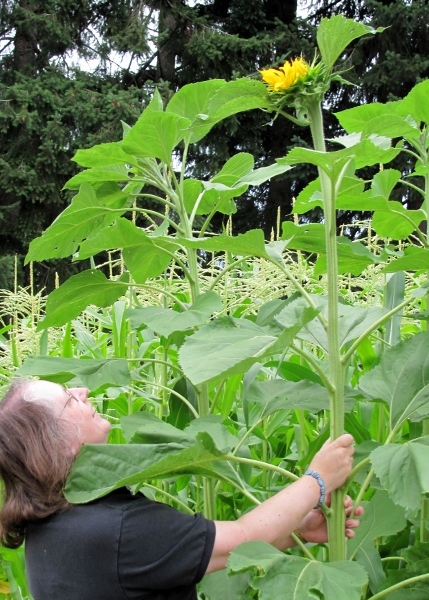 The tallest plant reached exactly 12 feet tall and got the largest, and latest, head on it. 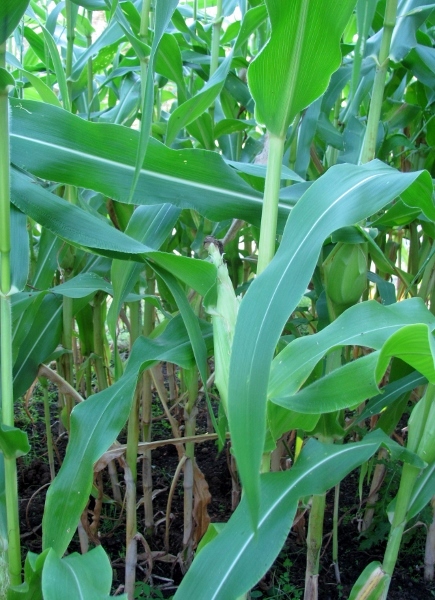 We left the plants to mature as much as they would while still on the stalks but an extremely heavy rainfall in early October began to topple the plants. We still let them dry on the stalks until late October when we chopped off their heads and put the stalks on the burn pile. The largest stalk was about 3" across at the base and the largest head was over 12 inches. We put two of the heads on the deck to see if the squirrels would eat them from there but nobody touched them. So we moved all 7 heads to the tree that the squirrel feeder is in. The biggest head is actually in the tree sitting atop the feeder. Apparently this is the yummiest one! The other 6 are arranged around the base of the tree and are getting some attention of their own. 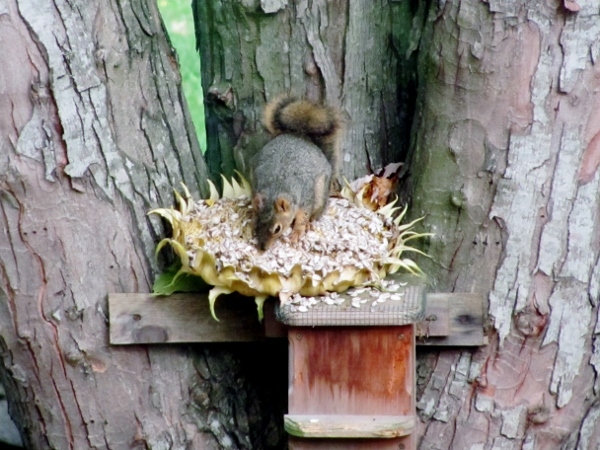 Squirrels and birds of all types have been picking at them. The most activity they get is when the one up high is 'occupied' and a second or third squirrel wants a snack too. Nobody at home at the moment. I just grew these for entertainment: in watching them grow, in seeing how large they would get, in watching the squirrels eat them. I guess this experiment was a success. 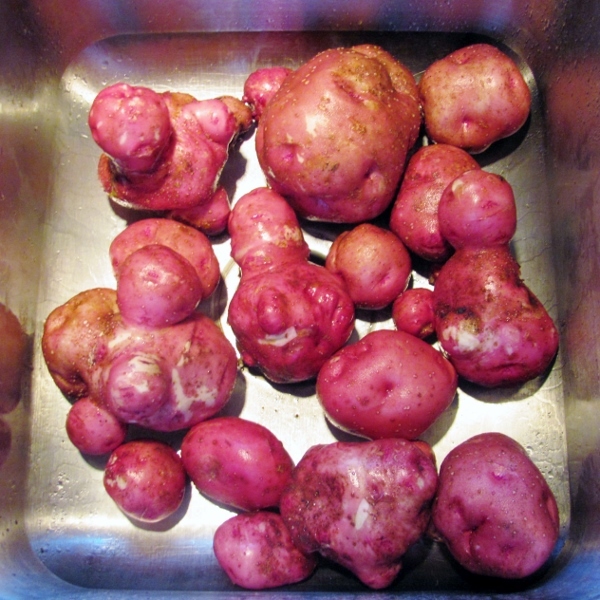 Wishing to make a potato salad I dug up a hill of red potatoes. Oh my word! I dug up 10 pounds from one hill! I peeled the small and medium sized ones and still had all these giant potatoes left for later. For the sake of scale the upper center round one is about 7 inches across! Big enough for a pot of mashed potatoes all by itself. I couldn't pass up the opportunity to show off some more garden produce. We added just a glazed chicken breast to complete a meal including fresh sliced tomatoes, hand cut oven fries, and corn on the cob. 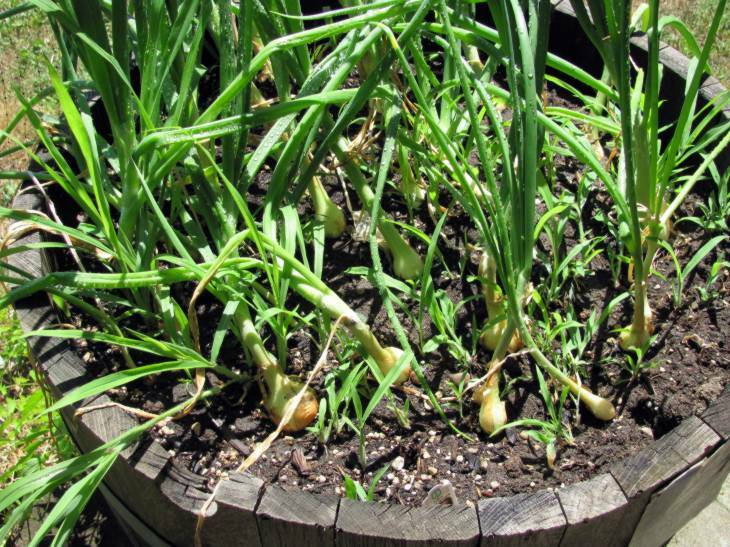 In the past I have grown sweet or yellow onions from sets and had only marginal success with the bulbs only getting about 2 inches across. This year the store did not have any sets but had starts instead. So I planted these and, WOW! They took off! I don't think a single one failed and I have probably 15 to 20 pounds of sweet onions. 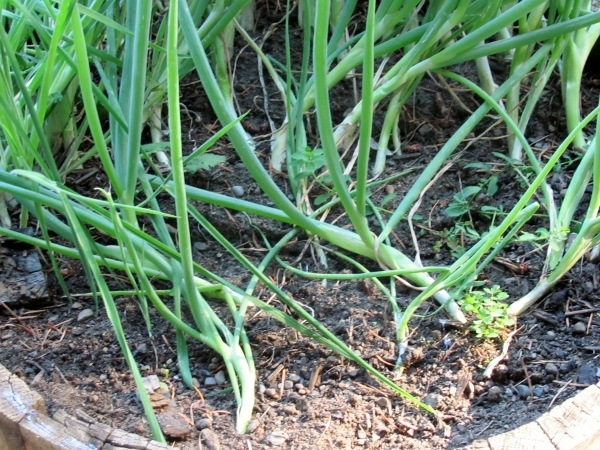 I still did the green onions in a barrel from seeds and they have done really well this year as well. 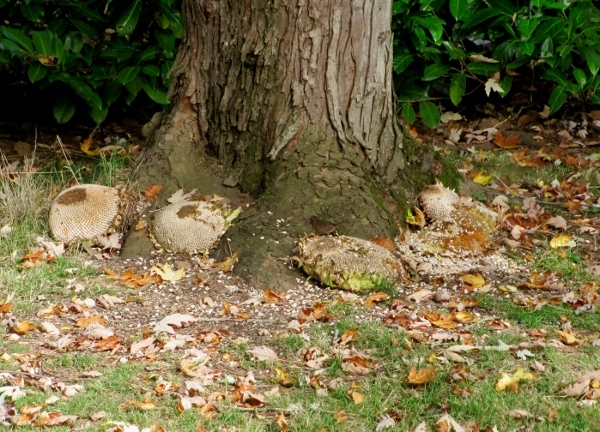 You can see bare spots where we have been pulling these for snacking. In past years I have had such poor luck with tomatoes that I planted more this year. I figured that if yield was down I could compensate that way. Wouldn't you know it ALL of the plants are heavy with fruit. 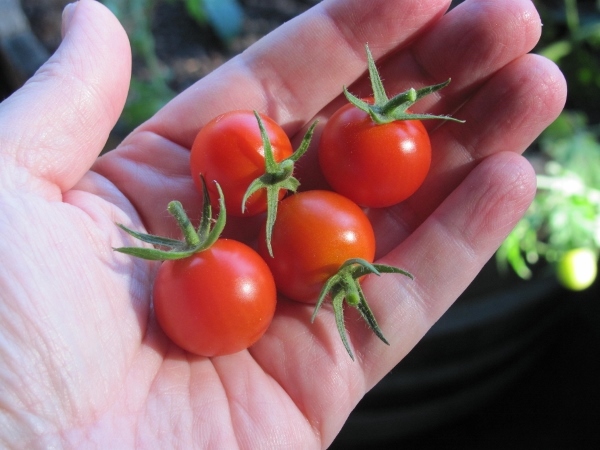 I planted three each of cherry tomatoes and large grape tomatoes (I thought they were Roma) and 9 (yes NINE) of slicing tomatoes. Update on the garden. 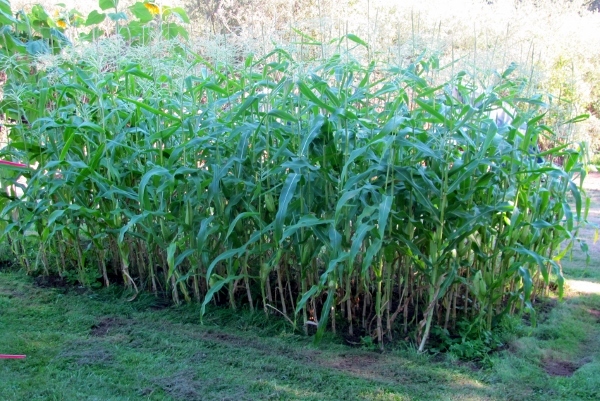 We have had great success with the new corn patch this year. Big, tall stalks and well polinized. However, I may have planted too densely. We've only had one ear of corn harvested yet but you can see it is coming right along. LOVE fresh corn on the cob. This is the first time I have grown sunflowers. 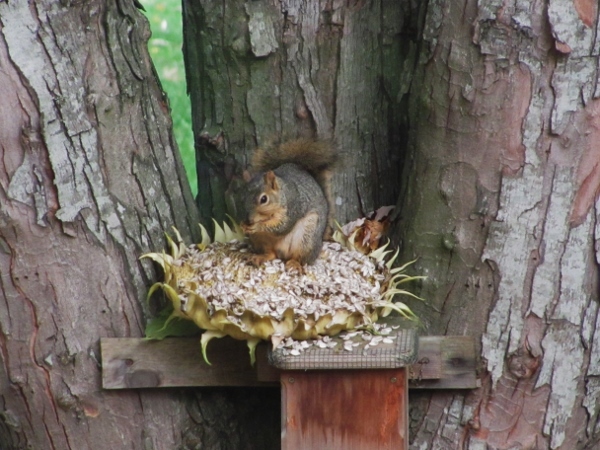 I thought I'd give them a try so we could leave the dried heads out for the squirrels to munch on. These things shot up like Jack's beanstalk. The second week in August they started to flower. I am 5'3" and this plant is HUGE! I would say this was a garden success. 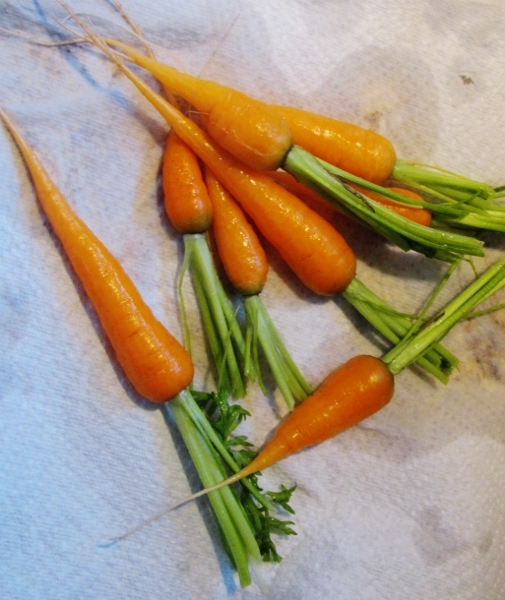 We've actually had lots from the garden already thid year but these are the first carrots I pulled up (back in mid-July). They are coming along nicely and are very sweet and tender. We've also consumed a single turnip, lots of lettuce, spinach, a dismal few radish, and a few strawberries. 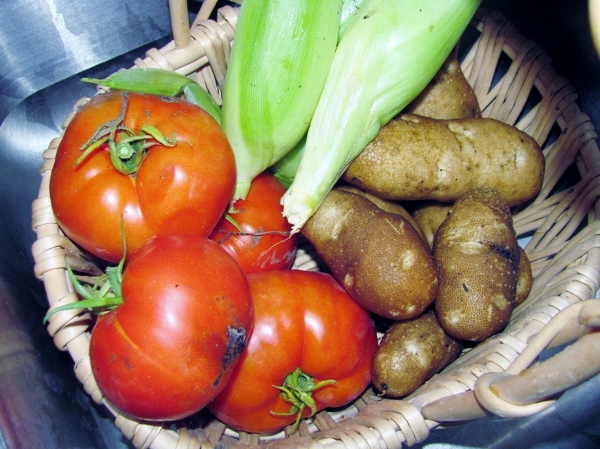 By the time you read this we will have added to that potatoes, beets, beans, and peas. 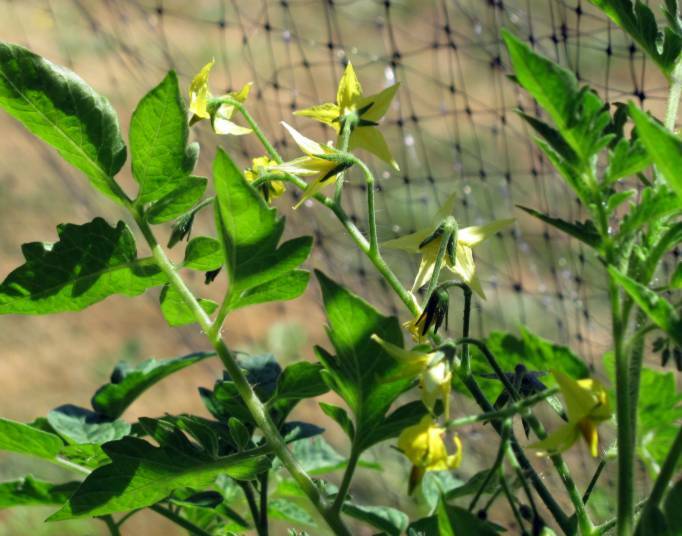 There is a possibility that corn and tomatoes may be on the menu by now as well. The 2013 garden is IN! (OK, two small exceptions I'll expound on later). Here is the main garden with the barrels up on the patio and the raised bed extension we built last year. LEFT TO RIGHT the barrels are planted with: Turnips, Carrots, Beets, Radish, Green Beans, Cherry Tomatoes, Spinach, Peas, Lettuce, Cucumber, Green Onions, Sweet Banana Peppers. This is the first time I have tried Turnips and Peppers. IN THE RAISED BED LEFT TO RIGHT: Strawberries, Blueberries, Grape Tomatoes, Slicing Tomatoes, Sweet Onions, Yukon Gold Potatoes, Red Potatoes, Russet Potatoes. 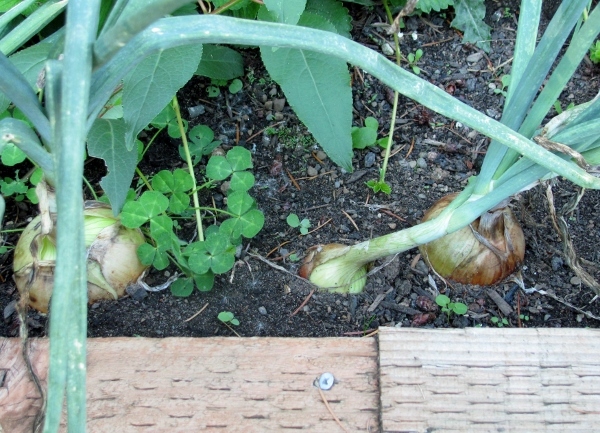 There are also sweet onions in a border around the back and left of the bed. The single strawberry plant and single blueberry bush are all that survived of last year's attack of the deer grazers. Neither of the raspberry bushes made it through that. This is the first time I've tried the grape tomatoes and it was an accident. I went by the picture on the package and thought I was getting Roma tomatoes. Only the lower left cage is grapes, the other three are slicing tomatoes. In the tires there are three each of each potato type and each tire has three plants (9 total of each variety). I have additional tires to tower these when the plants get tall enough. The entire raised bed will get tall fence posts and netting to try to keep the deer from grazing. It worked when we just had the barrels and hung the netting from the deck above. We're keeping our fingers crossed for adding it around the outside. (If all else fails, we DO like watching the deer and are not adverse to sharing). 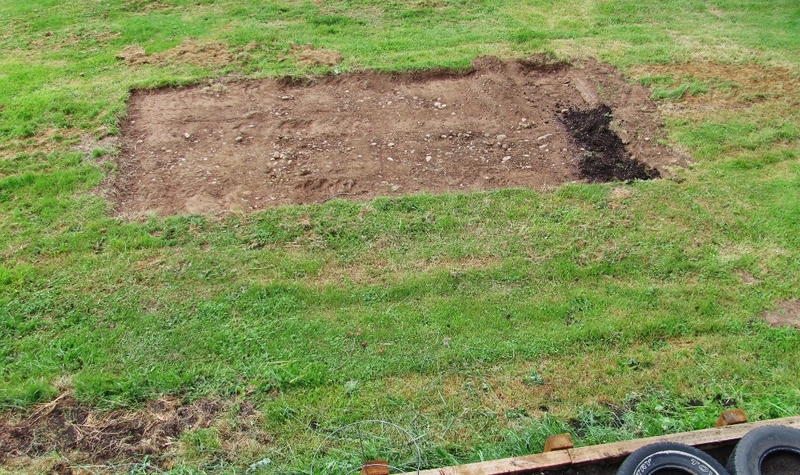 We used the tractor bucket to scrape off the sod and will be tilling this and adding topsoil. The left end will be a small plot of sunflowers to grow seed for the squirrels. 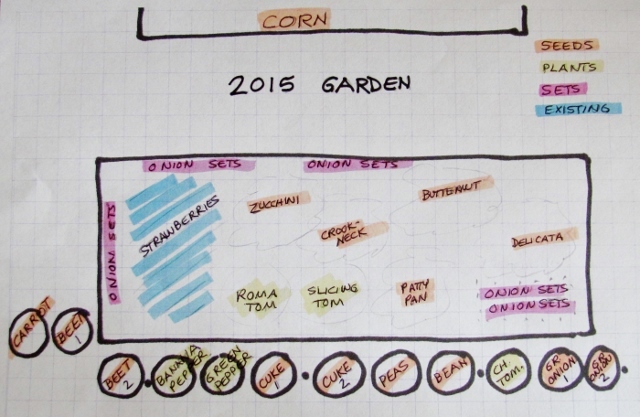 The bulk of the plot will be Sweet Corn. I always have such hope the day I plant the garden! OK, technically I should say 'I assembled that'! I wanted a potting bench for the patio so I would not have to go trooping into the house to get tools, seeds, fertilizer, gloves and pots. 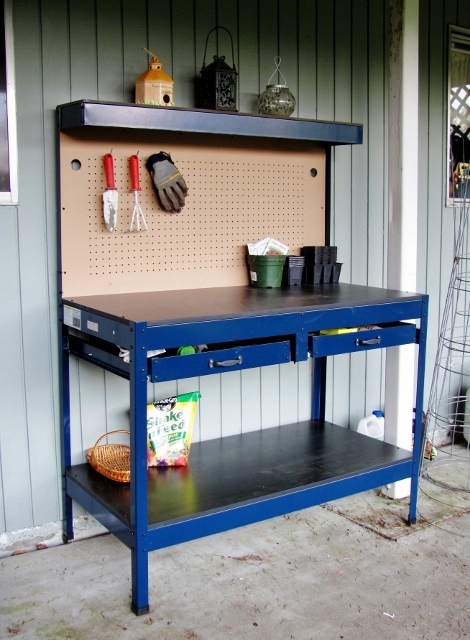 We found this steel workbench at Harbor Freight Tools on sale for $100! This is not 'some assembly required'. It is 'here's your box of parts, get a box end wrench and a screwdriver'. Even the drawers had to be assembled. The only thing that comes pre-assembled are the runners on the drawers and the sides they fit into... oh yeah the caps are already on the legs, too. It comes with a light assembly that mounts under the top shelf but it won't be used at night and it is out of doors, so I did not install that. It has a built in extension cord that has three outlets on the side of the unit, too, but it is not likely that I will need those for potting plants and seeds. Nice pegboard on the back wall with hooks included. I used them for hanging my trowel, mini-rake and gloves. A lower shelf can be used for chemicals, pots, etc. Bring on the nice weather, it's time to get planting! 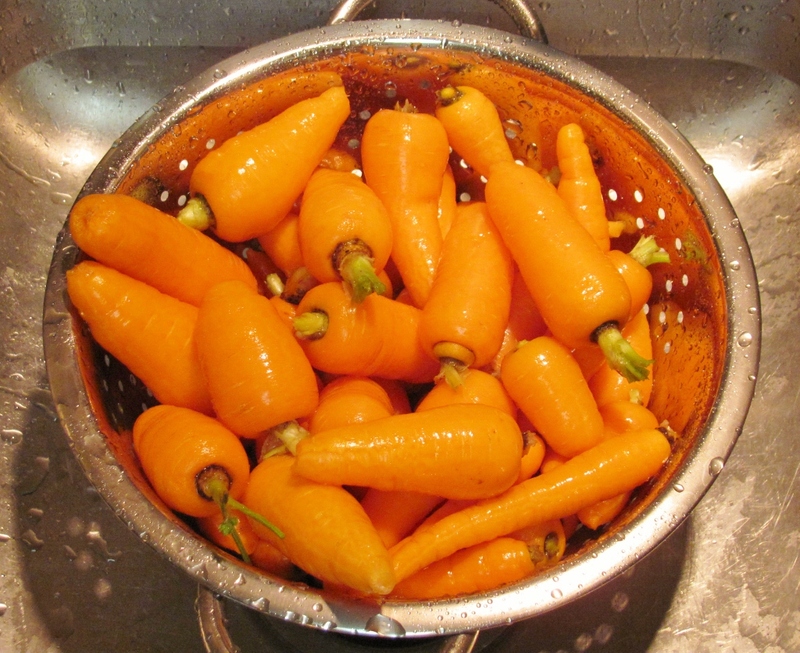 I pulled up the last of the garden produce today - the carrots. 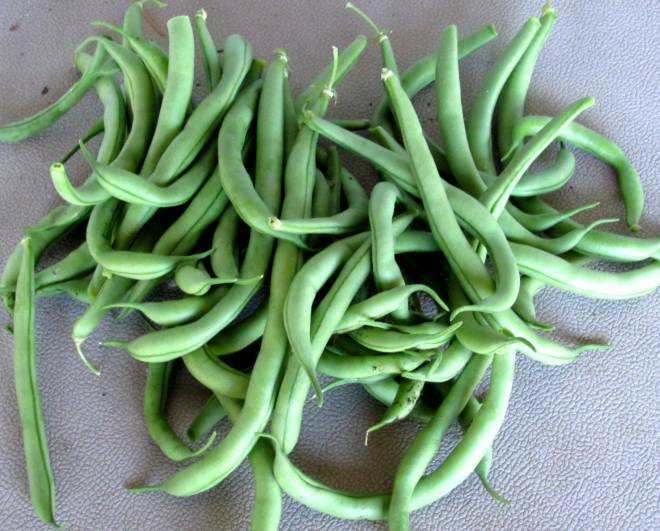 This is the best crop of them I have ever had, though most of them were stubby they made up for it in girth. This batch is about 1/4 of the total I got from the single barrel I planted. I dug the last of the Yukon Gold potatoes last week and transfered them to cold storage. I got tired of throwing out every 5th one because the squirrels ate chunks out of them. Why don't they eat the purple potatoes? We didn't like them much anyway! So I left the rest of the purples in the ground and the squirrels can eat on them all they want this winter. I'll dig up and discard the remains in the spring and plant only the kinds WE like - and then try to figure out a way to keep our squirrel friends out of them. Through the magic of technology this entry has delayed posting of a full month. The photos below were actually taken August 3.